Gold, a precious metal, known for ages to appreciate in value has been used to make jewelry over the years. There are four main types of gold especially as relating to jewelry; their features and attributes are explained below. This is of the highest purity and price. The purity of karat gold indicates the pure gold content in the jewelry. Therefore, karat gold jewelry amongst others has the highest amount of pure gold in it. Karat gold does not fade with time. For a jewel to be categorized as karat gold, it requires at least 10 karat or 41.7% purity (in some countries 9 karat). Vermeil is a thick layer of gold made through electroplating, its core metal is sterling silver. 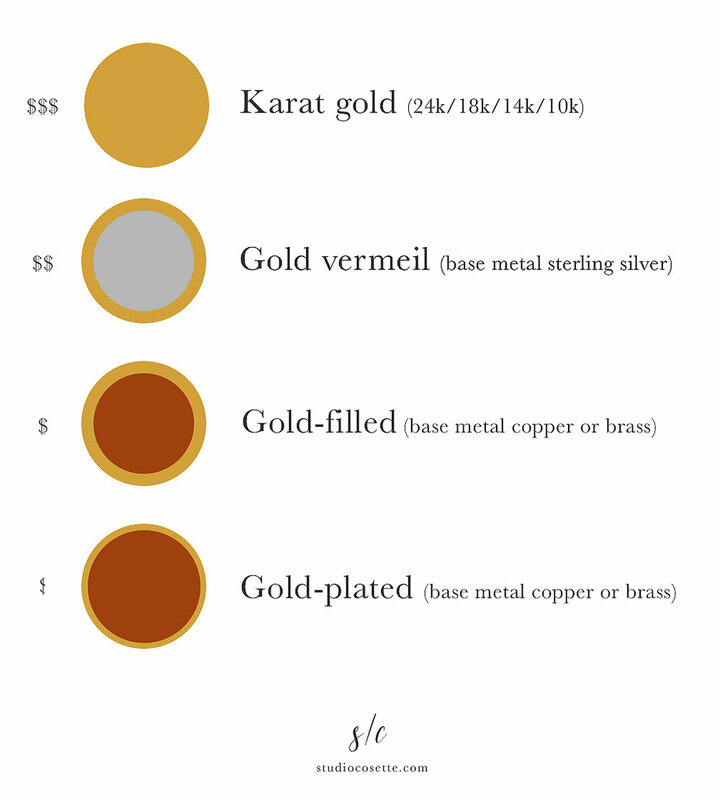 In order for the jewelry to be accepted as gold vermeil, the gold must be 10 karats or above and gold thickness should be at least 2.5 microns. Gold-filled jewelry, is more economical than karat gold. Gold-filled is created by pressure bonding a layer of gold to another metal such as copper or brass. It does not tarnish or rub off or turn colors, it is suitable for people who have allergic reactions to certain metals. Gold-filled jewelry can be worn daily without fading or rubbing off for years. Gold-filled jewelry has the same alluring properties and look of karat gold. Gold-plated jewelry is the cheapest gold. It is good for anyone with a tight budget. It is produced by electroplating which is using electricity to deposit a very thin layer of gold on another metal. This process produces a thin layer ranging from 1/1000 to 3/1000 thickness of gold on the other metal; usually brass or copper. For gold plated jewelry, the gold layer fades over time because the molecules that make up the base metal transfer to the thin gold layer, therefore breaking it down. Gold plated jewelry is known for its practicality and availability in different designs and styles. I hope you will find these information helpful and hopefully they will help you decide what material works best for you. If you have any questions, feel free to leave the comment below. I'd love to hear from you!